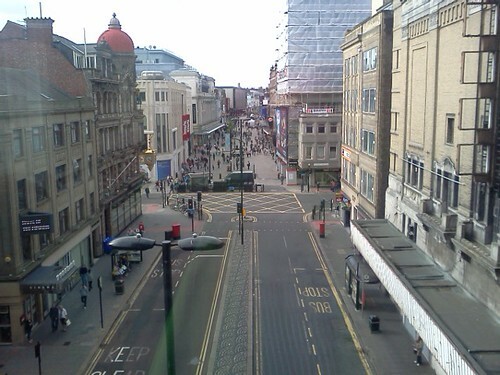 We have obtained a report [60Mb – slow loading] from Newcastle City Council that has a thorough look at Northumberland Street, its street environment and interaction with people, how the space works (or not) as a destination. We’ve only seen it now, but the report was completed last year. Here are some of the conclusions and recommendations. There are a few quick wins to raise the project profile and engage with new partners. The most amazing bit is that the report then goes on to right-out recommend trialling bike use in Northumberland Street between 17:00 – 10:00. This is really excellent news. It is this sort of thing we’ve asked for, certainly with renewed vigour since the petition in 2010, but we know this bike ban has been a simmering item since the birth of Northumberland Street. The temporary closure of Blackett Street on a series of Sundays is also proposed as a quick win. This could help the city to rethink the space around Monument and Eldon Square as well as over to the Laing Art Gallery; and maybe our confusing and pervasive bus routing will get simplified sooner of later (another long-standing call of ours). For that reason, we are definitively in favour of councils taking back control from the bus companies. The report also makes the point that gaining political buy-in and ensuring feedback to consultees should form part of the next set of action. Admittedly, we are unsure why the report wasn’t shared readily with contributors like us last year. 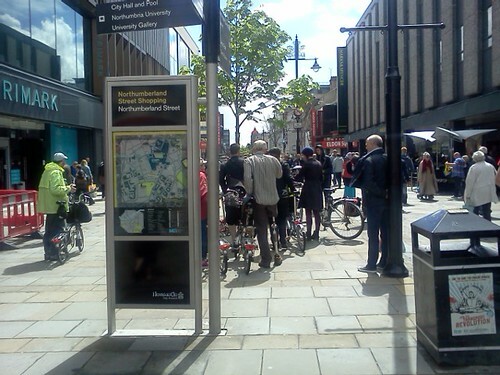 Then there is the suggestion of an annual ‘Great North Ride’ family fun and elite bike race throughout the city with associated green events to change perceptions about the streetscape of the city centre would be a good thing too. Maybe council has listened by bringing the SkyRide to Newcastle and Gateshead? So, city centre SkyRide 2014 here we come! The entry points to the North and South into Northumberland Street are also discussed. Barras Bridge and New Bridge Street should be looked at for people-friendly design. The authors were prompted by the increasing space problems and clashes between high pedestrian flow and (impatient) bus drivers (particularly on New Bridge Street). Well, and beyond that? Let’s redesign John Dobson Street and Pilgrim Street. And when at it, giving the city back to people, why not look to pull Grey Street back from its languishing linear car park existence and make it a destination? From the report: Embrace cycling in the city as a key criteria for livability!